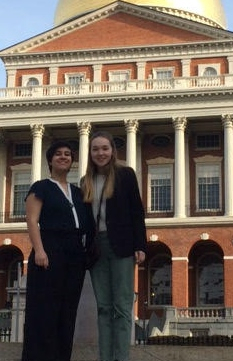 On April 5, 2019, Gina Pasciuto '19 and Grace Barrett '20 participated in the Annual Massachusetts Student Government Day where they took on the role of State Senator for the day. This event draws students from across Massachusetts and provides them with the opportunity to learn about and experience how our state government functions through debating and voting on two bills that focus on issues relevant to people their age. Gina and Grace got to participate in a committee debate in the Senate Chamber regarding House Bill 2007 - An Act for no organized head impacts to schoolchildren below 7th grade and Senate Bill 1279 - An Act regulating flavored tobacco products. The day also included introductions/presentations by a variety of local state government officials including House Speaker Robert DeLeo, Senator John Keenan, and Associate Justice Dalila Wendlandt. On our first ever Day of Giving Back, we received over 600 donations!